With their town under the deadly control of industrialist, robber barron Bartholomew Bogue (Peter Sarsgaard), the desperate townspeople of Rose Creek employ protection from seven outlaws, bounty hunters, gamblers and hired guns. Led by Sam Chisolm (Denzel Washington), the seven prepare the town for a violent showdown - aware that they may not survive the battle ahead and that they are fighting for something more important than money. The Magnificent Seven is an entertaining remake of the 1960 classic movie starring Yul Brynner, Steve McQueen and Charles Bronson. While the seven men in 2016 are markedly more diverse, there is nothing particularly innovative in director Antoine Fuqua’s film. This is Western 101 and no genre clique or trope is left underutilised. Fuqua’s film boasts a truly outstanding cast. They are a joy to watch. Denzel Washington brings emotional heft and gravitas to his role as Sam Chisolm, Chris Pratt effortlessly steals every scene as Josh Farraday and Ethan Hawke gives a passionate portrayal of Goodnight Robicheaux. If the rest of the team feels a little under-developed, they are certainly no less powerful in the screen time that they are given. While the cast of The Magnificent Seven are, indeed, magnificent, the film itself fails to achieve this level of success. It is (at 2hrs 12 minutes) half an hour too long, many scenes feel perfunctory and the movie lacks genuine excitement and tension. The Magnificent Seven is an enjoyable couple of hours of Western nostalgia with a wonderful cast. However, it is not a film that will linger long in the memory. The original Magnificent Seven was itself a remake of Japanese director Akira Kurosawa’s 1954 film, Seven Samurai. It is wonderful to see Ethan Hawk and Denzel Washington together again on screen. They were, of course, both superb in Antoine Fuqua’s Training Day. 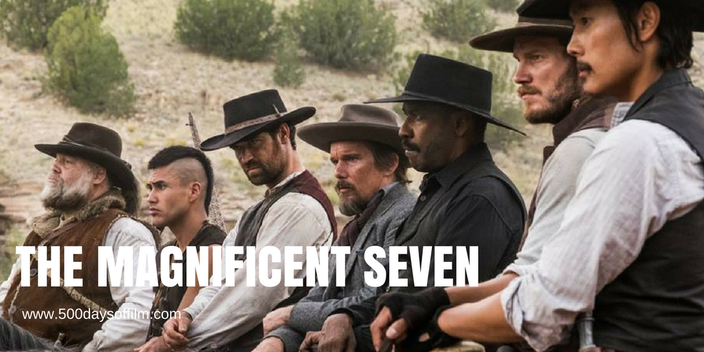 Have you seen The Magnificent Seven? If so, what did you think of this movie? Let me know! Leave me a comment in the box below!